Go to original pattern for design DROPS 165-40. 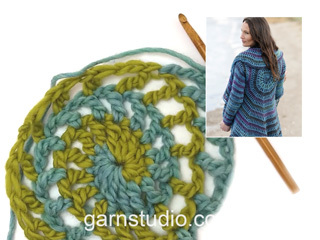 Crochet DROPS jacket worked in a circle in "Big Delight" and "Karisma". Size: S - XXXL. 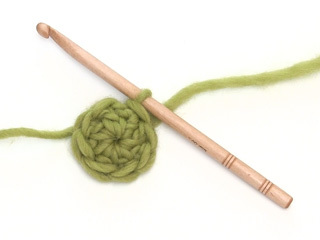 DROPS CROCHET HOOK SIZE 6 mm – or size needed to get 12 dtr in width x 4.5 dtr vertically alternately with 1 round Big Delight and 1 round Karisma = 10 x 10 cm. 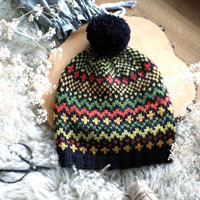 You can get the yarn to make this pattern from	24.80£. Read more. 2 dtr tog into 1 dtr as follows: Work 1 dtr but wait with last YO and pull through, work 1 dtr in next st but pull last YO through all 3 sts on hook. Replace first dtr on round with 4 ch. Finish with 1 sl st in fourth ch from beg of round. ROUND 1: 1 ch, 1 dc, 2 htr, 2 tr, 2 dtr. Insert 1 stitch marker in loop on last dtr so that it does not unravel and place yarn aside. Switch to Karisma and work as follows in loop: 1 dc, 2 htr, 2 tr, 2 dtr. Pull the yarn end to tighten loop. Fasten the yarn end on the back side. ROUND 2: (Continue with Karisma). Work 1 dtr + 1 ch in each of the first 7 sts (= 1 dc, 2 htr, 2 tr and 2 dtr worked with Big Delight). Insert 1 stitch marker in loop on last dtr so that it does not unravel and place yarn aside. Continue with Big Delight. Work 1 dtr + 1 ch in each of the next 7 sts (= 1 dc, 2 htr, 2 tr and 2 dtr worked with Karisma) = 14 dtr + 14 ch. ROUND 3: (Continue with Big Delight.) Work 1 dtr + 1 ch + 1 dtr + 1 ch in each of the first 7 dtr, insert 1 stitch marker in loop on last dtr so that it does not unravel and put yarn aside. Continue with Karisma, work 1 dtr + 1 ch + 1 dtr + 1 ch in each of the next 7 dtr = 28 dtr + 28 ch. ROUND 4: (Continue with Karisma). * Work 1 dtr + 1 ch in the next dtr, work 1 dtr + 1 ch + 1 dtr + 1 ch in the next dtr *, repeat from *-* 7 times. 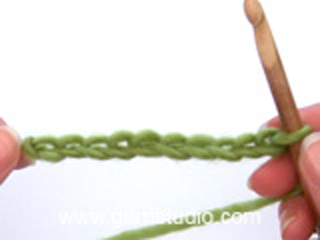 Insert 1 stitch marker in loop on last dtr so that it does not unravel and place yarn aside. Continue with Big Delight. * Work 1 dtr + 1 ch in the next dtr, work 1 dtr + 1 ch + 1 dtr + 1 ch in the next dtr *, repeat from *-* 7 times = 42 dtr + 42 ch. ROUND 5: (Continue with Big Delight.) * Work 1 dtr + 1 ch in each of the next 2 dtr, work 1 dtr + 1 ch + 1 dtr + 1 ch in the next dtr *, repeat from *-* 7 times. Insert 1 stitch marker in loop on last dtr so that it does not unravel and place yarn aside. Continue with Karisma. * Work 1 dtr + 1 ch in each of the next 2 dtr, work 1 dtr + 1 ch + 1 dtr + 1 ch in the next dtr *, repeat from *-* 7 times = 56 dtr + 56 ch. Repeat 4th and 5th round but on every round work 1 dtr + 1 ch more between every inc = 14 dtr + 14 ch inc on every round. Continue until there are 112-112-126-126-140-140 dtr + 112-112-126-126-140-140 ch on round, circle measures approx. 20-20-23-23-25-25 cm from centre (= 40-40-46-46-50-50 cm in diameter). 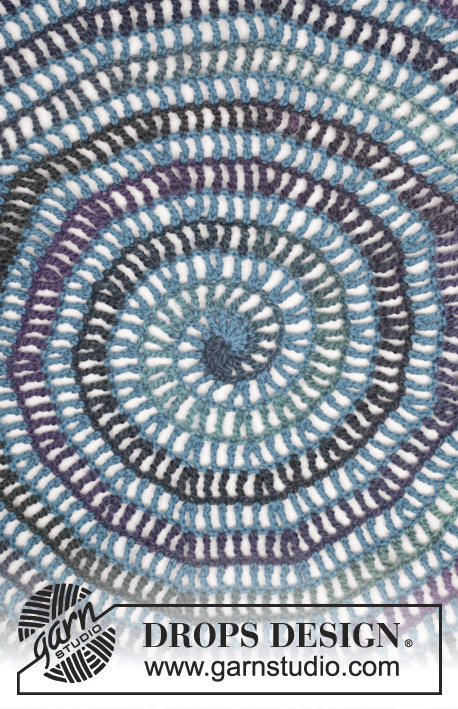 Work next round as follows: (Continue with spiral and colour change but without inc.) Work 1 dtr + 1 ch in each of the first 16-16-18-18-20-20 dtr, work 24-24-28-28-32-32 loose ch for armhole, skip the next 16-16-18-18-20-20 dtr, work 1 dtr + 1 ch in every dtr until 32-32-36-36-40-40 dtr remain on round, work 24-24-28-28-32-32 loose ch for armhole, skip the next 16-16-18-18-20-20 dtr, work 1 dtr + 1 ch in each of the last 16-16-18-18-20-20 dtr. * Work 1 dtr + 1 ch in each of the next 7-7-8-8-9-9 dtr, work 1 dtr + 1 ch + 1 dtr + 1 ch in next dtr *, repeat from *-* 2 times, work 18-18-20-20-22-22 dtr with 1 ch between each around ch-space, * work 1 dtr + 1 ch in each of the next 7-7-8-8-9-9 dtr, work 1 dtr + 1 ch + 1 dtr + 1 ch in next dtr *, repeat from *-* 3 times. 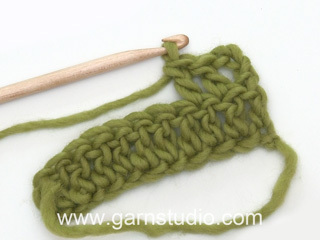 Insert 1 stitch marker in loop on last dtr so that it does not unravel and place yarn aside. Switch yarn. * Work 1 dtr + 1 ch in each of the next 7-7-8-8-9-9 dtr, work 1 dtr + 1 ch + 1 dtr + 1 ch in next dtr *, repeat from *-* 3 times, work 18-18-20-20-22-22 dtr with 1 ch between each around ch-space, * work 1 dtr + 1 ch in each of the next 7-7-8-8-9-9 dtr, work 1 dtr + 1 ch + 1 dtr + 1 ch in next dtr *, repeat from *-* 2 times = 126-126-140-140-154-154 dtr + ch on round. Work as 4th and 5th round but on every round work 1 dtr + 1 ch more between every inc = 14 dtr + 14 ch inc on every round. 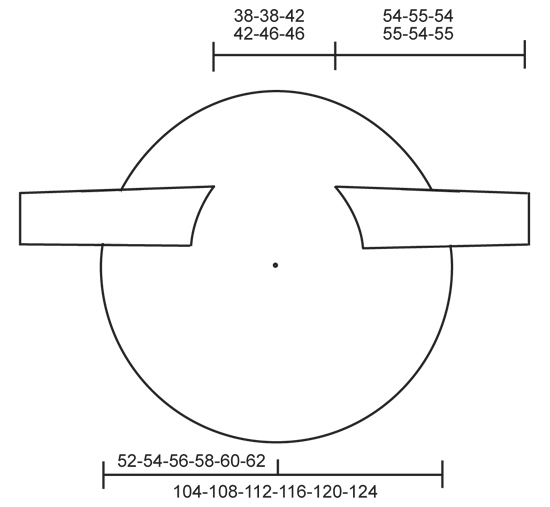 Continue until circle measures 52-54-56-58-60-62 cm from centre (= 104-108-112-116-120-124 cm in diameter, or desired measurements). Finish circle as follows: Continue with the same yarn as last round. Work 1 dtr in each of the next 2 dtr, 1 tr in each of the next 2 dtr, 1 htr in each of the next 2 dtr, 1 dc in next dtr, 1 sl st in next dtr, fasten off. Work the same way in the other side. Work in the round from armhole and down. Use hook size 6 mm and beg with opposite colour of the one the last dtr around armholes was worked with. Work stripes, i.e. 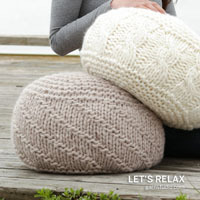 work 1 round with Karisma and 1 round with Big Delight - READ CROCHET TIP. Work 36-38-40-42-44-46 dtr around the opening for sleeve, beg of round should be under sleeve. Then work 3 rounds with 1 dtr in every dtr. Continue with 1 dtr in every dtr - AT THE SAME TIME dec 2 dtr mid under sleeve - READ DECREASE TIP. Repeat dec every 8 cm 6 more times = 22-24-26-28-30-32 dtr. Continue to work until sleeve measures 54-55-54-55-54-55 cm. Fasten off. Work the other sleeve the same way. Er det meningen at cirklen skal kunne ligge fladt? Jeg har været nødt til at hækle to ekstra omgange for at få 20cm i diameter før ærmerne i str s. Så jeg har mere end de 112 dbstm men det tænker jeg at jeg må kompensere for, jeg har ikke kunnet få fastheden til at passe. Jeg har taget ud hver gang efter samme systematik med en dbstm mere mellem hustagene men cirklen flaner mere og mere. 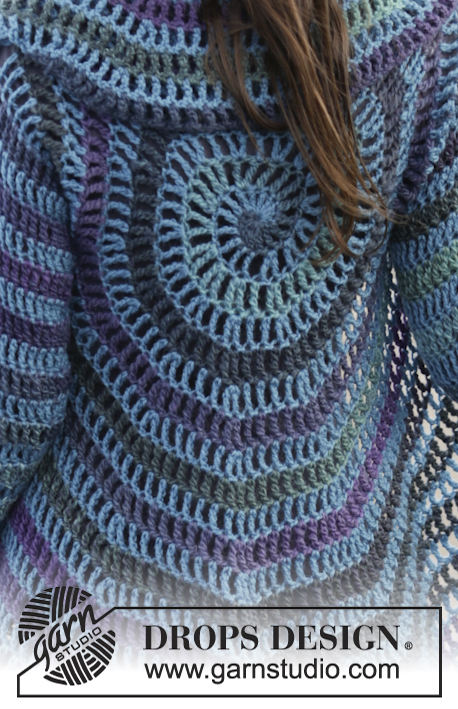 How many triple crochets are there in the round after adding the chain for the armholes in the size small? It can't be 126 if there were 224 before the armhole round. 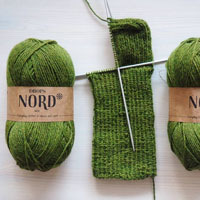 Dear Vicki, before armhole, there are 112 triple crochets + 112 chains (= 224 sts in total) on next round working chains for armhole, you don't increase, then on round after armhole you increase as before 14 triple crochets = 112-14= 126 triple crochets + 126 chains (= 252 sts in total). Happy crocheting! 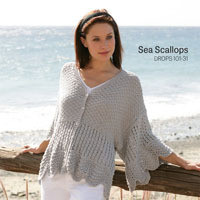 Am I supposed to have a total of 112 or 224 triple crochets for a size small before starting the round for armholes? Then how do I get to a total of 126 triple crochets for the round after doing the chains for the armholes? I'm not switching to different colors. Dear Vicky, you should have 112 triple crochets + 112 chains = 224 stitches in the round before starting the armholes in size S. In 3rd and 4th size, you continue working as before until you get 126 triple crochets + 126 chains. Happy crocheting! Hej Elizabthe, Det har vi ikke, men hvis du deler ærmet op i 4 og så hækle 10 dbl-st i hver del... så bliver de jævnt fordelt. God fornøjelse! In toer 5 ben ik met beide kleuren tegenover elkaar geëindigd. Nu word toer 6 beschreven als een gehele cirkel qua steken. Ook al doe ik de helft, dan kom ik nog niet uit terwijl ik wel de goede hoeveelheid steken heb ik toer 5. Wat ik nu heb gedaan is dus half om half. Dus het ene armsgat is met kleur a, het andere met kleur b. Maar hoe moet ik verder gaan aangezien er weer een volledige cirkel word beschreven. Bonjour Muriel, au tour suivant les 32 ml des emmanchures, crochetez 22 double-brides espacées d'1 ml autour de chacune de ces 2 chaînettes . Bon crochet! You missed my point. The pattern is bad and needs to be rewritten. If you're constantly having to explain the sleeves in the comment section it means the pattern itself is poorly written and needs to be better explained. Fix the pattern. Please review and clarify this pattern, especially the section that starts with \"Work next round as follows: (Continue with spiral and color change but without inc.) Work 1 tr + 1 ch in each of the first 16-16-18-18-20-20 tr, work 24-24-28-28-32-32 loose ch for armhole...\" The pattern isn\'t clear (further evidenced by all the comments asking for better instructions), and the stitches aren\'t correctly counted. This pattern needs to be better written. (or rewritten altogether). Dear Mrs Pearce, this round is worked without any increases as before, ie you will crochet 1 tr and 1 ch as before - see number for your size - following pattern as before (= change yarns as you did before, ie half round worked with each quality), then skip the given number of sts for the armhole, work 1 tr, 1 ch as before over the bottom sts and skip the given number of sts for the armhole, continue to the end of round. You will have 2 chains (= "holes" for sleeves) and 1tr, 1 ch around. On next round, you will simply continue working as before in the sts as well as in both chains for armholes, increasing as before to enlarge the circle. Happy crocheting!